Home → News → The Latest → Don’t Forget the Birds! We are getting another major snow storm here in Portland, OR. Heavy snow and ongoing temps in the teens and 20s are not the norm for us, but we are doing our best to keep going. I can’t even imagine how hard it is for the outside critters! I usually only see the starlings in the spring, when they show up with their young and attack the suet feeders. 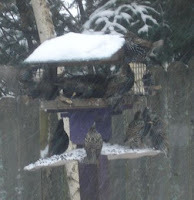 I took this picture through a window, but I think you can see it is STANDING ROOM ONLY for the suet and the seed. Right now it’s 24 degrees – must be the perfect temperature for a bath or a dip in the pond. Perhaps they think they are penguins! The Bluejays, Juncos, Thrushes, Sparrows, Flickers, Towhees and Nuthatches are all getting their fair share, too, as are the squirrels and chipmunks. If you are fortunate enough to be visited by outside critters, keep them in mind during this cold spell. I know they will appreciate it! I have been leaving unsalted peanuts in the shell in a feeder for my little squirrel friends and you just know they have to appreciate it so much. It’s so cute to watch them from the window as they nibble through the shells to get to the actual peanut. I feel really terrible for the birds who are here, having to live through these storms we’ve been having. I can’t even get out of my driveway to run out and buy them some seed. On a different note, your book “For Every Dog and Angel” was mentioned in one of the forum threads on http://www.tripawds.com and information was given as to how to contact you and how to order the book and the rainbow bridge writstband. I added my comments to reflect my extreme joy & pleasure since I now own the book. Hopefully, you will get many orders from that website alone. You deserve it, Chris, and I plan to order all of your books and many more copies of “For Every Dog and Angel” to give to friends who have lost a pet. This may take me a little while so I can come up with the money to make these purchases and, of course, I’ll need more rainbow bridge wristbands to include with each book. Thanks for your wonderful writing and the beautiful quality of your books. Vicki, I’m sure those squirrels are very grateful for the peanuts! Thank you for sharing your thoughts about my books with the visitors to the Tripawds forum. What an incredible resource they are for people whose dogs are coping with cancer – perhaps on three legs!